It is a 3 room apartment with 80 sqm, ideal for craftsmen or fair visitors / exhibition exhibitors. The apartment has 3 bedrooms each with a single bed (140x200 cm); a clear corridor; a white shower room and a large kitchen with balcony. The apartment is on the 2nd floor and thus the uppermost apartment in this house with three apartments. Ideal for craftsmen who also need to sleep during the day. Nobody is upside down. The apartment also includes a separate, dry and lockable basement where tools or materials can be stored between. Each room has a large TV and super fast WiFi / WiFi is available throughout the apartment. The fully equipped kitchen is the access to the balcony possible. The large eat-in kitchen also has a TV. There is also a washing machine in the kitchen. 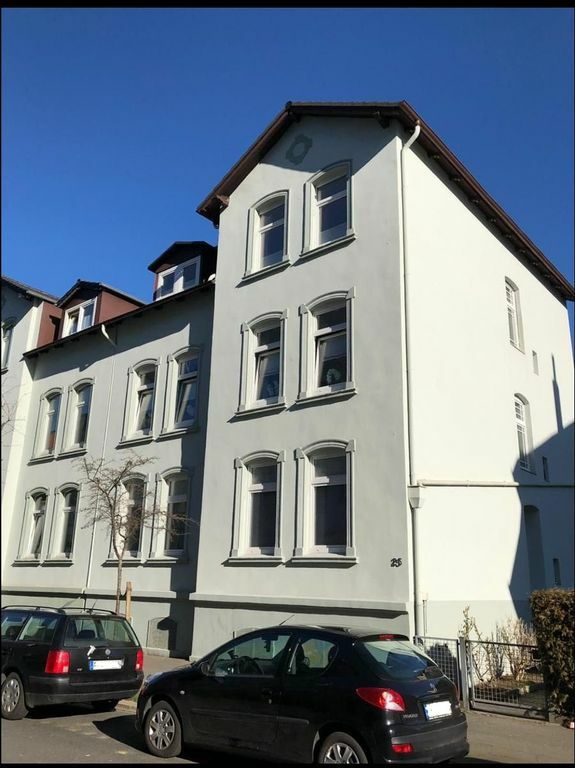 The house is located in the middle of Peine in visible proximity to the Schützenplatz in a quiet cul-de-sac. The house was built in Art Nouveau style and has beautiful high stucco ceilings. Parking is free in front of the house or on the Schützenplatz. The train station and pedestrian area are a three-minute walk. The nearest supermarket is 2 minutes walk away. On the Hagenmarkt (also within 2 minutes walking distance) is 2 times a week weekly market and there are many restaurants. The historic marketplace is a 5-minute walk away. The highway can be reached by car in about 3 minutes (A 2, exit Peine). The fair in Hanover can be reached by car in normal traffic in about 35 to 40 minutes. The train from Peine train station to Hanover central station takes 23 minutes. The tram will take you in less than an hour by public transport to Hannover Messe. Furthermore, you can reach in less than an hour by car (in addition to Hannover) the cities of Braunschweig, Hildesheim, Wolfsburg with the Autostadt, Salzgitter and Hildesheim. Also in less than an hour by car to reach the memorial Lengede (The Miracle of Lengede), the former concentration camp Bergen-Belsen and the memorial Dora, the Harz or Marienburg, the headquarters of the Guelphs. You live in the middle of the city but still quiet in an apartment in an old Art Nouveau building with high ceilings and stucco. Quiet side street. ample free parking in front of the house. Train station, city center, restaurants, pubs and supermarket within a few minutes walking distance. By train you can reach Hannover and Braunschweig in 23 or 20 minutes. By car in less than an hour beyond the cities Celle, Wolfsburg, Hildesheim, Salzgitter and the Harz. Concerns tenants wishing to pay the costs of the tax or to submit their reimbursement to their employer. Your landlord is a holiday home. A holiday home gives them two bills. One as a deposit including the fees of apartment and a second bill about 4 weeks before their arrival. This is their tax proof etc .. If you take the exit Peine by car, you will be at the house in 3 minutes. Hannover and Brunswick can be reached in 30 minutes. The fair in the south of Hannover in 40 minutes drive. Within an hour you reach Hildesheim, Celle, the beautiful old town of Wolfenbüttel, Salzgitter and Wolfsburg with the Autostadt. Also, they are within an hour centers in the Harz. In 2 hours see Berlin and Potsdam respectively Hamburg. The train station is 3 min walk from the house. Even without a car no problem. In 20 minutes by train you are in Braunschweig or Hannover. Also the airport Hanover or the fair Hanover can be reached by train and S-Bahn. A supermarket is 200 meters away. In 3 minutes you are on foot in the pedestrian zone. So absolutely right in the middle.